Jani Allan takes leave from the restaurant to visit the City of Brotherly Love. She marvels at the calorific waves of the food bazaar where the offerings have been lovingly prepared by the Mennonites and the Amish. She also takes us on a tour of the celebrated Flower Show with its ‘celebrate the movies’ theme. There are few times that I take off from the resto. If I don’t mule, I don’t eat. In the past decade I can count the number of times I have gotten my shift covered on one hand. Once when a girlfriend got married and I made a speech at her wedding. A couple of times when I was ill and lost my voice. But this week when Bev invited me to the Philadelphia Flower Show, the offer was more difficult to turn down than a duvet. Is is often said that this, the oldest and largest of flower shows, is as much about what folks are fleeing from as what they are flocking to. I wanted to flee from the icy tundra of New Jersey. This year it has been a desperately cold season with sleet that claws at the soul. At crack of ten, Bev and I drove to the picturesque town of Yardley to catch the train to Philadelphia. We took her car, because my little car behaves like a baby-carriage in snow. At the station you could tell at once who were flower-show bound: those that I refer to (fondly) as being in the metallic age: silver hair and gold teeth. They are the senior citizens in toothpaste white trainers who only have to pay a dollar for the train journey. Bev told me that we were going to meet a couple of girls at the Reading Terminal Market for lunch and then mosey across to the Convention Centre where the Flower Show is held. The Reading Terminal Market, established in 1892 at 12th and Arch Streets, is the nation’s oldest continuously operating farmers’ market. It is one of the greatest public markets in the country. And rounds and sirloins tell of cattle one! 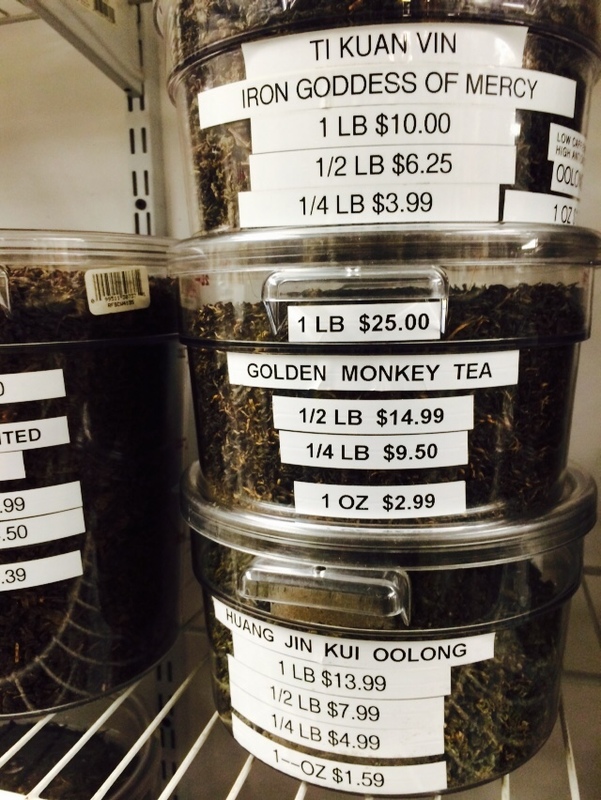 Iron Goddess of Mercy tea. It’s a vast food bazaar with more than 80 stalls. Giant lobsters signal feebly in huge tanks (remind me to get on to PETA about that) and oceans of seafood lined the fishmonger stalls. There were Babel-high towers of Amish cheeses, a Versailles of chocolatiers and bakers, all the teas in China, honey from 23 different flowers, hand made crafts and American quilts.. It was all I could do not to be knocked down by the calorific waves on display. I watched transfixed, as Amish bakers twisted soft pretzels as though they were knitting with yarn. “What do you fancy?” said Bev. The choice ranges from Asian and Middle Eastern to authentic Mexican, Philadelphia and Amish. They were indeed wearing neon-coloured takkies that sported flashing lights. Verboten by the Amish who wear clothes without buttons because buttons indicate a certain showing offiness. I ended up having a cup of lentil soup and buying a tiny bag of raw almonds. My girl chums were less stringent. Bean burritos, hoagies, sausage sandwiches and Bassett’s ice-cream. “If I lived in Philly, I would be at Reading Terminal Market every day. I would also be 100 lbs heavier,” I heard one woman admit cheerfully. She must have weighed 250 pounds. Then it was time for the Flower Show. 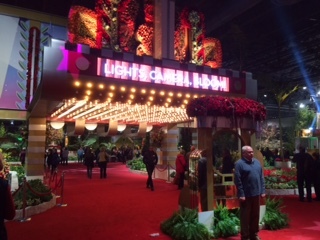 The silver screen will burst into living color at the 2015 PHS Philadelphia Flower Show from February 28 to March 8 at the Pennsylvania Convention Center. Every guest will feel like a star and every garden a magical setting as the world’s great floral and landscape designers capture the beauty and spirit of the world’s great cinema. My flabber is not easily gasted. But the Flower show came close. 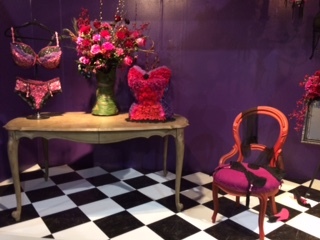 As we walked onto a red carpet, a neon light flashed ‘Lights, Camera, Bloom.’ America’s glitzy garden floral homage to Hollywood is mind-wateringly luscious. A botanic feast remarkable for its profligate use of calla lilies, tulips, and irises. 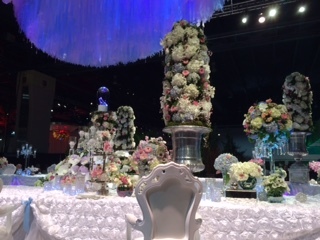 The show-goers will have been transported to a Persian pavilion beckoning across a shimmering lake; a spring terrain draped in fragrant flowering bulbs; and gazed at Trump towering bridal arrangements worthy of that ilk. 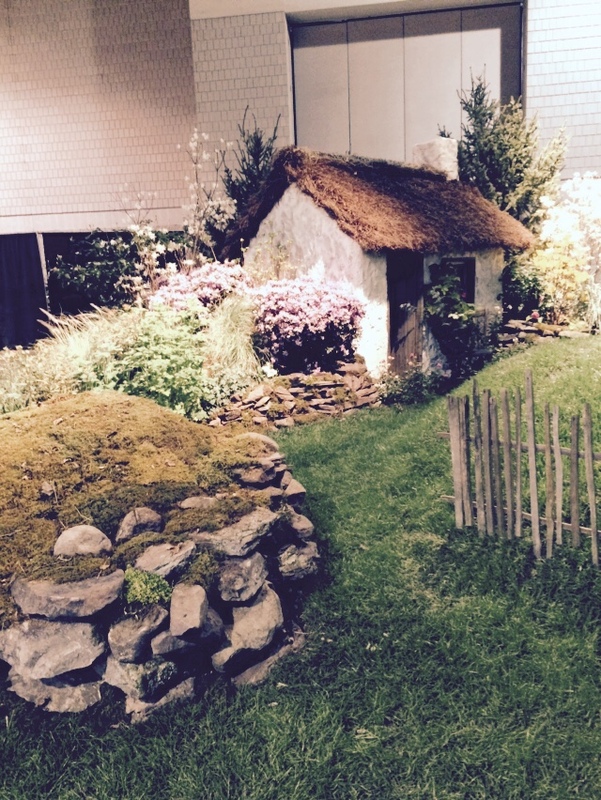 I wandered around enchanted by the inventiveness of the garden designers. “Cars”, “Frozen”, “Maleficent,” “Cinderella” and dozens of other movies were interpreted in plants and props. A survivalist’s steel bunker repurposed from a hulking fuel storage tank. The living area featured a wall-mounted TV, speakers and a recliner fashioned from a dentist’s chair. The tropical vegetation — including bottlebrush and eucalyptus trees — suggested an Outback wilderness where nature is struggling against an arid environment. The story line? In a dystopian world, a guy has retreated to the bush to create a verdant redoubt against a world turned hostile to humans and plants alike. “It’s a bit of a bloke-y garden, it’s masculine but it’s not just aimed at men,” explained the designer. People moved and surged. Many times I was nearly run over by a Hover-around. At other times I was poked by someone in a wheelchair. Americans en masse are massive. Some had the shape of Chesterfield suites, bless them. There were cooking demonstrations – fifty nifty things to do with Basil etc and flower arranging classes. My best were the teeny displays, no bigger than a jewellery box complete with tiny plants. One representing “The Wizard of Oz” had the detail of a Persian miniature. Tiny striped stockings indicated an upturned witch. An open door in the little house allowed one a glimpse of a shelf of crockery that was falling. When it was time to call it a day, I asked Bev about the hundreds of people who were sitting in rows outside the hall. We plopped down at a table. One of the girls opened a bag of Irish potatoes she had bought at the market and proceded to eat them with some miso soup. There was a small misunderstanding when she disappeared with Bev’s bag, but in the end all was well. It was sleeting when we got off the train in Yardley. Bev and I did the penguin walk – head forward – to her car. The car was iced over like an igloo. “Oh nooo! I’ve forgotten the ice-scraper!” said Bev. I took the Ikea catalogue I had been given and used it to de-ice the windows of the SUV. I knew it would come in useful for something. Everyone should go to the Philadelphia Flower Show at least once in their lives. It is a consoling thought that while political crises and fashions appear – only to vanish – gardens and their laws of birth and death endure.